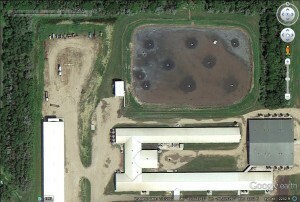 Photo of a pond with hog buildings next to it. Pond has aeration equipment installed on it. Environmentally, PondLift offers the most powerful farm technology of the past 6 decades. A. Air quality improvements: Storage and Processing Odors are eliminated, including Sulfide, Ammonia, and other noxious odors. B. Elimination of Greenhouse gasses, including methane, oxides, and others gasses only associated with anaerobic activity. C. Stabilization of Nitrogen, by converting manure forms into Ammonium ion form, saves the valuable Nitrogen for fertilizer use. The Ammonium is a nutrient form not easily vaporized, nor easily lost from the soil. Ammonium is adsorbed directly into the plant leaf system and is most valuable applied directly to the leaves. Ammonium is most valuable applied to leaves, and is not required to even be reaching the soil structure. D. Farm operation costs are reduced: Less labor and less energy is used in manure handling. The ease of nutrient storage and distribution allows the farmer to adapt additional technology to distribute the nutrients more effectively on his schedule. PondLift eliminates the reliance on the tight schedule of hired tankers or dragline hose operators, who must operate “rain or shine”. E. Natural and Organic farming is becoming more respected, and Composting is a mainstay of that activity. Decomposition in an aerobic treatment pond is a realistic alternative to traditional “Composting”. Either Composting method offers an active “tea”, which, when distributed to the crop canopy, or if sent to the soil through dragline activity or tanker distribution, is very productive in distributing the valuable “nature” maintained within the pond. 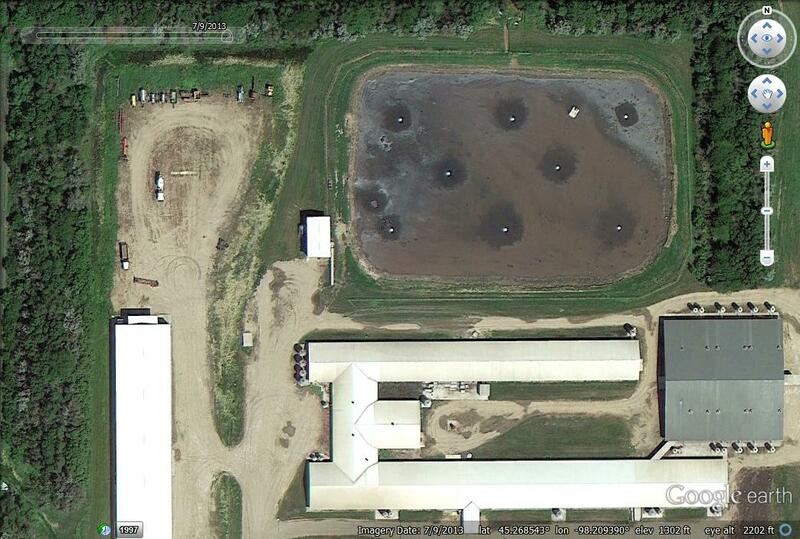 F. Elimination of manure runoff issues. When farmers can apply nutrients directly to the growing crop, it is much more valuable and effective. Having the manure pre-decomposed allows the distribution to occur on the farmer’s schedule, at the most timely period, instead of “off-season” before or after cropping, just to get rid of it. Raw manure has a high potential for runoff, even if knifed into the soil. Especially when pumped at high rates, knifing allows manure to ooze up through the cracks. PondLift use can allow the farmer to eliminate handling of raw manure. GPS controlled equipment and other tools allow farmers to modernize and maximize their operations. Implementing WISE technology brings additional options for GPS equipment. PondLift allows a new era of farming, where manure is quickly decomposed in an odorless manner and the nutrients are stored for application to growing crops, and the nutrients are stored and distributed safely and in an environmentally responsible manner.